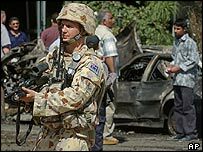 Several Australian former diplomats and defence chiefs have accused the government of misleading Australia over the reasons for going to war in Iraq. In an open letter, the 43 signatories said the decision was based on false assumptions and deception. They also said Australia's involvement in the war had raised its profile as a potential target of terrorism. The government said that while there were intelligence failings it had not misused information in its possession. In a similar statement in April, retired British diplomats criticised the UK Prime Minister, Tony Blair, for his support of what they described as doomed American policies in the Middle East. The letter's signatories include former heads of the Australian Defence Force, former departmental heads and senior figures in the intelligence and diplomatic communities. They demand an end to the Australian government's "rubber-stamping" of US policies and called for a more balanced approach. "We are concerned that Australia was committed to join the invasion of Iraq on the basis of false assumptions and deception of the American government," the letter said. The regime of Saddam Hussein may have gone, but his removal was not the reason given for going to war, they said. But Mr Howard rejected the attack, describing the arguments used in the letter as "old news" and a "misrepresentation". But the opposition Labour Party said the statement was "unprecedented". Australia has been a staunch supporter of the US-led war in Iraq, sending around 2,000 troops for the invasion. It maintains a force of 850 in the country.